Clouds are the key element for the understanding of the global radiation budget. It is widely assumed that the formation of clouds are affected by anthropogenic emissions of trace gases and aerosols. These so-called indirect aerosol effects are regarded to be of major relevance for the full understanding of the climate system and the human affect on the latter. In adddition, the formation processes of clouds and precipiation and their interaction with aerosol particles are to date only weakly understood. The experience of the working group of ground-based remote sensing in the characterization of aerosol properties in combination with new techniques for the remote-sensing of clouds allow to perform aerosol-cloud-interaction studies. 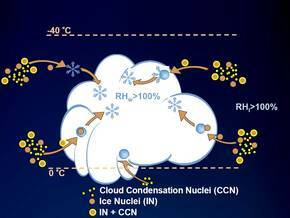 Investigation of heterogeneous ice formation processes: At temperatures between 0°C und -40°C clouds can consist of both supercooled cloud droplets and ice crystals. By means of Polarisation-lidar-measurements ice crystals present within supercooled cloud layers can be identified. Based on this technique, e.g., studies on the relationship between temperature and the role of ice formation can be investigated. Determination of mikrophysical properties of liquid-water clouds. The dual-field-of-view lidar technique, which was developed at TROPOS, is applied to determine the liquid water content and the effective radius of cloud droplets in ambient clouds. In addition, the cloud droplet size distribution can be estimated. Effect of vertical winds on cloud microphysical properties: Measurements with Doppler lidar and with cloud radar provide vertical wind velocities below and within cloud layers. Based on these measurements, the effect of vertical winds on the microphysical properties and on ice formation processes within clouds can be investigated.